Keep your bunny out of the sun, especially if he’s confined. He needs access to a shady, well-ventilated space at all times. Consider setting up a fan to keep air circulating around him, but don’t aim it directly at him all the time. A rotating fan is ideal. Be sure to keep the cord out of reach. Create a cool breeze by draping a damp towel over your rabbit’s cage. Just set the fan to blow through it. A piece of marble or ceramic tile retains coolness. In his cage, it can be a great place for a siesta. Rabbits consume twice as much water as food. If they don’t drink, they won’t eat. Completely replace your rabbit’s water at least once a day, and never let his water supply run dry. Wash his water dispenser regularly. Stagnant water leads to sick rabbits. Use a heavy, spill-proof crock for drinking water. Add a few ice cubes to make it more tempting. The crock will not only keep the water cool, but also keep your rabbit cool when he lies nearby. We don’t typically think of solid foods as liquids, but many fruits and vegetables are 80 to 90 percent water. They can actually help your bunny stay hydrated. Carrots, celery, melon and greens are good examples. Ask your veterinarian for specific recommendations. Always add any new foods sparingly, one at a time, to make sure they agree with your rabbit. Do you wear fur in the summer? Rabbits do. Brush out any excess fur to let your rabbit’s skin breathe. If you have a long-haired rabbit, summer might be the time for a trim. Fill a plastic water bottle or two-liter soda bottle almost full with water, then freeze it. Once it’s frozen, place it in your rabbit’s cage for him to lie against. Keep a steady supply on hand in your freezer. 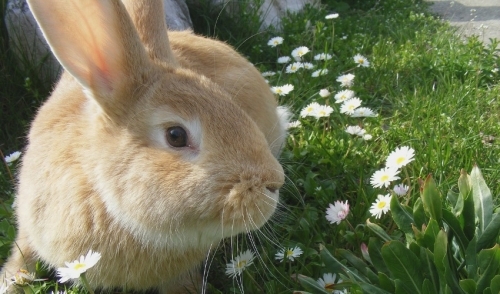 If your rabbit is overweight or more than five years old, watch him closely in hot weather. Rabbits that are less active won’t always make the effort to drink as much water as they need. Dehydration can lead to heat stroke, organ failure or even death. If your rabbit shows signs of heat stress, don’t take chances. Do not submerge him in water as this could put him into shock. Do not use ice. Dampen his body and his ears (rabbits disperse heat through their ears) with cool (not cold) water and rush him to a veterinarian immediately. Even if you are able to cool him down, go anyway. Your rabbit may still need IV fluids to prevent kidney damage. Warm weather can be an invitation to “fly strike.” This happens when a rabbit has loose stools or is incapable of cleaning himself. A sickly, obese or aging rabbit is most vulnerable. The moisture and odor attract flies, which lay eggs deep in the fur. A resulting maggot infestation can put a rabbit into terminal shock within 24 hours, so you must be vigilant about keeping your rabbit dry. Even indoor rabbits are susceptible. All it takes is one fly. If you can smell ammonia, that’s a sign of poor air quality. Remove urine and waste from your rabbit’s cage daily. Ammonia can damage the lining of his respiratory tract, making him susceptible to disease. Ask your veterinarian to recommend products to prevent fleas on your dogs and cats. This will lessen the chances that they pass along fleas to your rabbit. Never leave your rabbit unattended in a parked vehicle. Even if you park in the shade and leave windows open, the temperature inside your vehicle can reach 120º in minutes on a warm day. Overheating can lead to heat stroke, organ damage and death. If possible, leave your furry friend at home where it’s cooler.